I have 2 Customers looking for a protectant that can be renewed without having to completely strip each year. One has a composite deck made of iron wood. Is this product good for composite decks? Customer#2 has a fir deck that has been treated with water based stain, it is weathered and very dry but has a few patches of stain left. Should all the stain be removed completely. Should the fir have a light sanding before applying? Same question can will the deck accept a recoat without having to completely strip it first? Both homes are at high elevation with snow in the winter and one is in deep shade the other by a river. Jo, TWP is not compliant for Canada and cannot be used or sold there. I have a screened-in deck - built 13 years ago. Pressure treated wood (red type not the green). Deck surface has been restained with Behr product-some flaking with this product. Rest of deck never been restained - where protected by eaves, practically new looking - where in sun moderate to severe weathering. What product should I use to prepare the deck surface? What stain should I use? New pressure treated deck. Built 2 months ago, builder says its time to stain.. Which TWP product id best for this? We are in GA. I built a new cedar deck that I stained with Olympic Maximum cedar naturaltone yesterday. I have used the oil based product for years and loved it but the new water base formula was awful! I hate the color and the way it went on. I want to remove it and stain it with a TWP product. Hiw do I remove this stain I just applied and what stain should I use? I also have a cedar deck about 8 years old that hasnt been stained in about 3 years and is pretty weathered. It was stained with the Olympic Maximum oil based. I am in Texas. Thanks! New deck, cedar. good condition, bare. Looking to treat entire deck. Question: is there any benefit from applying the deck stain to all sides of the deck boards before installation? Wade, you must remove the Behr 100% before using TWP. It cannot be applied on top of it. What state are you in? I have a 400 sq ft deck that is 10 years old. part is stained with solid bahr which is 70% gone with power washing and the rail is semi transperant behr that is very faided. the deck is treated lumber. It is on the west of the house and gets a lot of sun in the afternoon and evening. I used your stain on a job in Missouri for a family and loved it. I cant find a local distributor near here. Which of the two stains will work best in my application. Wood is in fair condition. Laurie, strip and brighten the deck for the prep then stain with the 100 series. ann, strip and brighten the wood with the RAD Stain Stripper and Brightener. Stain with the TWP 1511 California Redwood. 4. Protected with One Time 4 years ago and it worked Ok but should have been applied again at 2 or 3 yr and is so expensive. I want to try semi transparent. Have a 30 year old redwood deck (8x10) that has been stained every 2 or 3 years with Cabot natural deck stain. The deck was dark brown after all these years. Have used a deck stripper twice and now want to get back to a more natural look and preserve it and maintain a lighter redish color. What do you suggest to clean, brighten and preserve the deck? Lou, we do not receive an order from you. 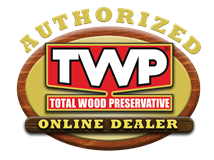 I tried to order 5 gallons of TWP 100 Cedartone. Entered all info to include creditcard , it did not appear to take and I got no email conformation. I don't want to double order, suggestions? Leon, if it is shiny then that means the stain did not penetrate completely. This is usually from over applying, improper prep, or combination of both. I would wipe the deck down with some lacquer thinner and some rags to remove the excess on top. Them let it dry for a few more days. Make sure to wet your rags with water when done to avoid accidental spontaneous combustion. washed redwood deck & power washed, applied honey tone 1500, its still looks shiny, used your product 2 years ago and did not have this problem. its been 5 days, still looks like i used olive oil, is there a way to wash this down a bit, without starting all over?